База HD Micro provides the perfect balance between a smoothing and mattifying effect. Ultra Foundation is a great choice, when considering the heat and desired look of natural glowing skin. HD Micro Cache палитра 5 цвята (Contouring) is used to enhance natural highlights and define contours. A focus on the cheekbones is key. 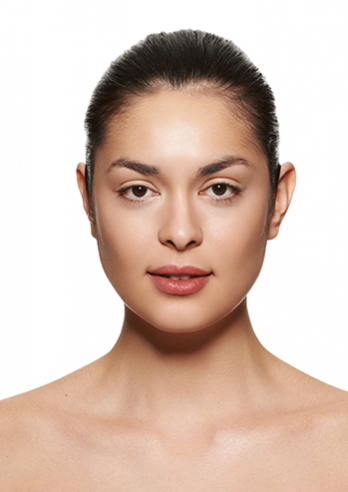 The contour is enhanced at the temples and below the cheekbone. Балсам за грижа за устните is applied liberally. HD крем очна линия (bronze) is firstly swept over the eyelid up to the socket line and underneath the bottom lash line. Eye Shadow Iridescent in Сенки за очи гланц (golden sand G) is blended all over the HD Cream Liner. Сенки за очи мат (tv brown) is blended into the outer corner of the eyes and close to the root of the bottom lashes. Сенки за очи мат (shading brown) is added for a warm contrast. Сенки за очи мат (eggplant) and Lake are blended into the outer corners of the eye and along the socket line, with higher concentration in the outer corners. With a small blending brush, both colors are then, in succession, applied underneath the bottom lash line. This layering effect of slightly different tones gives a richer depth to the smokey eyes. The eyebrows are defined with Компактна пудра за вежди (dark). 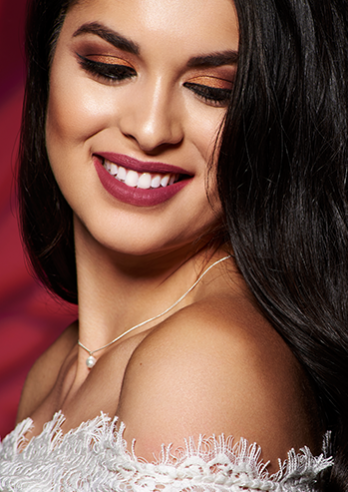 To add the typical sultry glamour to this look, HD крем очна линия (ebony) is applied along the top and bottom lash lines using a fine firm brush. The eyeliner gradually widens as it reaches the outer corner. The flick is placed by extending out and up from the natural curve of the bottom lash line. Individual Cluster Eyelashes in Small are built up using Лепило за мигли Pro 4 гр (black). From the Професионален комплект руж 15 цвята (Contexture) is loaded onto a fan brush with Shading Brown and R19. This warm blend of blush is then buffed along the cheekbone. Use this also to warm the jaw line and temples. Glamour Glow (natural tan) and Glamour Glow (bronzing sun) highlights the top of the cheeks and brow bone. Lip Stain (punk) and Lip Stain (gospel) are mixed together creating a rich matt lip.